Here & Now's Robin Young learns more from Chelsi Cheatom, program manager for Trac-B Exchange, a medical clinic in Clark County, Nevada. "Well the benefit is actually in this case time. It does take a lot of time to have someone sit there with a client and do one-on-one syringe exchange with them, and we realized that it would be a lot easier and a lot more time efficient for us if we could package everything up for our clients before they even arrived, and then make it easy for them to just go in and swipe a card or punch in some numbers at a machine and get the supplies that they need." "We have our clients come in and they fill out a short form and register for the program. They're also limited to only receiving two syringe boxes per week. Each box contains 10 syringes. ... 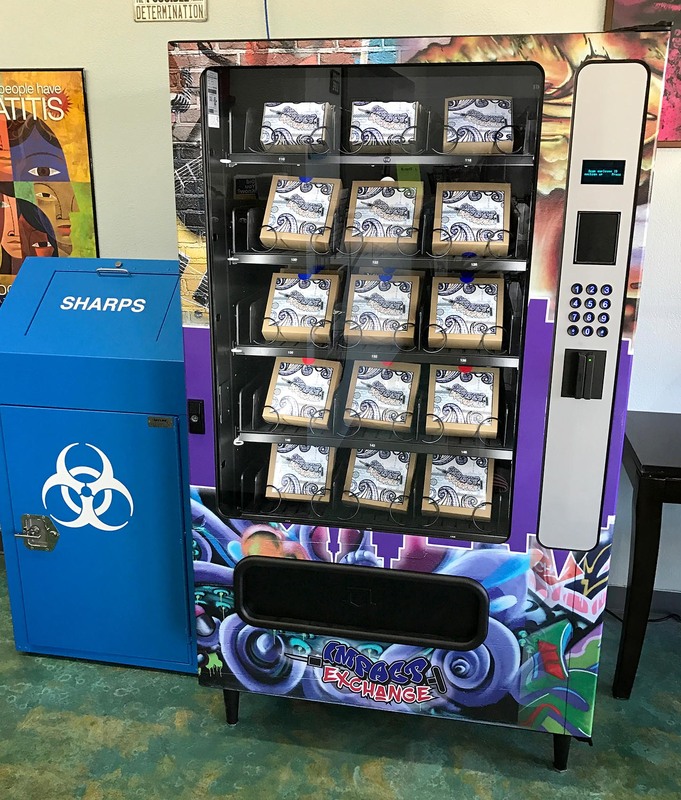 There's a sharps container that's sitting directly next to the machine where people can put their used syringes, and we will take them and dispose of them properly." 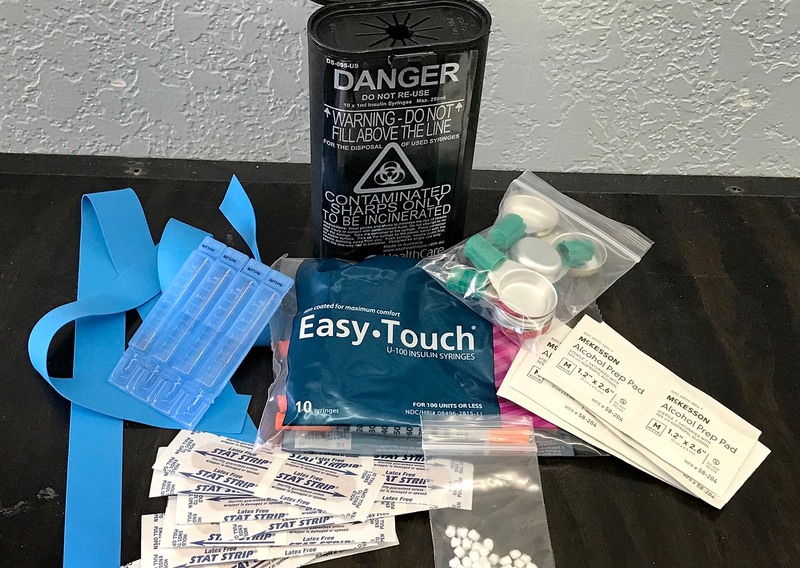 "A syringe exchange program should include information about HIV and hepatitis education, information about where people can receive testing, treatment and overdose prevention, and we are able to put flyers and pamphlets in the boxes that cover all of those things. And when they're ready to get into recovery, they know that anywhere where a machine is housed, it's a safe place for them to go." "That's a common thing that we've heard from other places that we're interested in getting vending machines. And from what we've noticed so far, people are returning those syringes to us. We've signed up around 400 people to use these machines in the last year, and we've distributed over 37,000 syringes this way." "The only downside that we've had to address is the fact that we are finding that we have to stock the machine more often than we thought we would. As the machines became more popular in the community and people started to use the machines more, we've had to stock the machines sometimes two to three times a week. Funding for this project is very limited. We were able to purchase the machines through funds received from Nevada AIDS Research and Education Society, and also some private and personal funds. But there's no federal funding for this program at all." "It's a possibility that it could become overwhelming, but the cost to treat someone for hepatitis C sometimes is over $100,000 per patient. So if we can reduce the cost on the back end by providing someone with a syringe that may cost us about 6 cents, it's worth it in the long run." This segment aired on May 14, 2018.